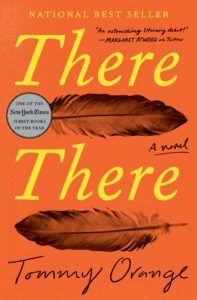 There There, the debut novel by Tommy Orange, takes a group of 12 Native American characters living in Oakland, explores each person’s history, and then throws them all together at the same event, a powwow at the Oakland Coliseum. There are recovering alcoholics, kids whose parents have left them behind, drug dealers, drug counselors, aspiring filmmakers and obese gamers… a kaleidoscope of interwoven lives of sadness, disappointment, resignation and the occasional glimpse of hope. There’s quite a lot to like about this searing novel. Orange takes his readers through a shameful litany of the ways America has treated and depicted Native Americans over the centuries before introducing his cast of characters, hanging a backdrop that provides the grim context for their lives. He revisits each character a few times throughout There There, tracking their progress toward the event that brings them all together at the end and exploring the reasons why they attended it. Some worked at the powwow, one went to meet his birth father, one discovered her birth mother, and some just went to get a better understanding of their Native American heritage. This isn’t a light read, but it’s a good one. Orange is an efficient, incisive writer who isn’t afraid to shock his readers with the harsh reality of our shameful history with Native Americans. Some of the characters ran together, but I started jotting notes at the beginning at each chapter, which helped. In the end, it’s the cumulative effect of their stories – not the individual threads – that really heighten the book’s power. I was disappointed by the ending, where Orange turned to violence to wrap up these stories. Is that his message? The only way out from these lives is blood and murder? History may have proved him right, but it felt like a cop-out here, especially after such a rich buildup. I listened to most of There There on audio, and it was narrated by four people – Darrell Dennis, Shaun Taylor-Corbett, Kyla Garcia and Alma Cuervo – who each took on a few characters. The narration was quiet and moving, fitting for the book. It’s a little confusing to listen to There There on audio, simply because the chapters are short and there are so many changes in perspective. I recommend having a copy of the print as well, and as I mentioned earlier, jotting down a few notes while characters were fresh was very helpful for me. Despite the ending, I recommend There There, both for the importance of the subject matter and the merits of the writing. It’s a worthwhile book and I am glad that I read it.